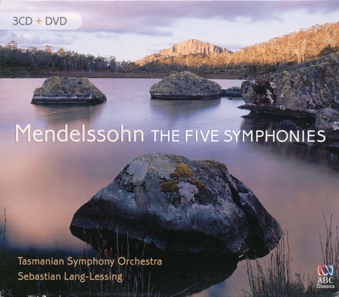 Tasmania is unlikely to be the first place that those in the market for a Mendelssohn symphony cycle turn their attentions. However, this release is well worth their consideration, it doesn’t have the polish of some of the central European competitors, but the interpretations are lively and engaging, and for the most part, the Tasmanian Symphony Orchestra shows itself to be well up to the challenges of this virtuoso repertoire. Their secret weapon is an expert (admittedly a young one) imported from the heartland of Mendelssohn interpretation, Sebastian Lang-Lessing. The box set includes a bonus DVD with a documentary about the recording project. It’s all a bit self-congratulatory, but the interviews with Lang-Lessing are very revealing. He is clearly a conductor with a strong vision of how Mendelssohn’s music should sound, and when required he is fully able to justify every interpretive decision. There is also footage of him conducting the orchestra (the documentary is intercut with film of a performance of the Scottish) and he is the kind of conductor who makes very broad, but flowing and continuous movements. Watching him gives rise to a suspicion of control freakery, as if he is unable to let go and allow the orchestra movements of repose, or the woodwind soloists the space they need. Thankfully, the recordings dispel any fears. They demonstrate a strength of his hyperactive conducting technique in the sheer energy he draws from the orchestra. The fast movements are, to my ear, the most successful of these recordings, the outer movements of the Italian, for example, and the finale of the Scottish. Lang-Lessing sets fast tempi, and each of these movements opens with an eruption of kinetic energy, which incredibly never seems to dissipate. The orchestral playing, on the whole, is very good, although they do sometimes struggle to keep up with Lang-Lessing’s pace. The 2nd movement of the Scottish, which admittedly is fiendish, requiring fast, quiet and precise playing, sees the woodwind and horns struggle to maintain the pace of the string accompaniment. There are similar problems in the finale, although here the strings are implicated too, their fast melodies, wide intervals and regular dynamic changes all contributing to some poor ensemble. In general though, the orchestral playing is good. The TSO is a chamber sized orchestra, and I suspect that they have a great deal of experience of the late classical repertoire, as they are very good at bridging the gap between chamber and symphonic playing. Their sound always has a warmth (listen, for example to the Andante 2nd movement of the 1st Symphony), but that never compromises the identity of the instrumental colours. If I were to be brutally honest, I would have to say that the strings sound superior to the winds, and the biggest difference between this recording and those by German orchestras is the lack of character from the woodwind soloists, none of whom ever seem able to stamp their individual identity onto the orchestral sound in their respective solos. There’s nothing wrong with their ensemble playing though, just listen to their reading of the chorale Ein feste Burg ist unser Gott in the finale of the Reformation: clean and precise, yet expressive and warm, heavenly! Competent singing from choir and soloists in the second half of the Lobegesang. The vibrato of the soloists is a little heavy for my taste, especially that of Sara Macliver, but it isn’t out of keeping. The choir have a keen sense for the drama of the music, and as with the orchestra, Lang-Lessing draws a really energetic performance from them. Tuning is not flawless, but is more than acceptable. One of the interviews in the documentary is with a recording engineer, who explains that most of the recording is from just two microphones in front of the orchestra with ‘highlights’ from closer mics when necessary. On the whole, this is a successful approach and achieves both immediacy and clarity in the orchestral sound. The choir are served less well, and there is a homogeneity to their sound that I suspect is the result of distant micing. All in all, this recording is a strong contender from an unusual source. On the European market, it may have a tough time up against some strong mid-price competition from the likes of Ashkenazy and Abbado. The sound quality, at least for the orchestra, should set it apart from those reissues, even if there are aspects of the orchestral playing that let it down. But, as I say, the real strength of these recordings is the sheer energy of the fast movements. You’ll often hear performances of the Scottish or the Italian that are reverential to a fault. Not so here, Lang-Lessing knows where to find real excitement in these scores, and more often than not the results are electric.